Does "Fender Acoustic Guitar" Sound Right? Does that sound sort of odd? We're more used to hearing “Fender Electric Guitars" "Strat" and "Tele". But Fender has been making acoustic guitars since 1962. They now manufacture a full line of acoustic and acoustic electric guitars. The man behind their acoustics was Roger Rossmeisl. Rossmeisl's father was a guitar builder in Germany and Roger worked for him. The father, Wenzel, mainly made archtop jazz guitars. Roger came to the U.S. and went to work for Gibson. He then moved to California and worked for Rickenbacker before starting with Fender in 1962. Leo Fender had some ideas that he wanted to see in an acoustic guitar. Rossmeisl designed the first acoustic guitars with Fender's ideas in mind. Fender began making several different models of acoustic guitar. They were mainly dreadnoughts with Fender style headstocks and bolt-on necks. Another thing that they had in common was massive neckblocks. Many of them also had an aluminum tube that ran from the neckblock to the endblock. The idea with the aluminum tube was to strengthen the guitar enough to put a thinner top on it. This was supposed to improve the sound. Apparently it wasn't enough of an improvement. By 1969 Fender had phased out their acoustic guitars. Fast forward to the present. 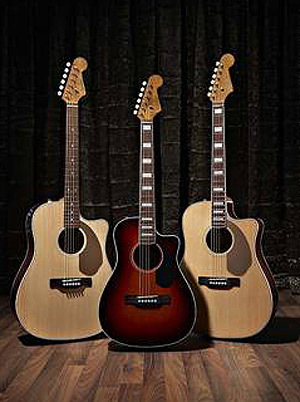 Once again, Fender has acoustic guitars in their lineup. The majority of them are now made in their Empenada, Mexico factury. The reviews on them have been mixed. Everyone seems to agree that the quality of construction is good. The sound is what seems to get the biggest mix of opinions. The buyer just has to remember that what it sounds like to them is what's important. Fender now owns Tacoma and Guild. Because of this, a Fender acoustic guitar will probably remain a low to mid-range instrument. But it might still be a good choice for your next guitar.